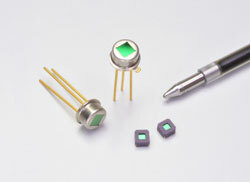 Hamamatsu Photonics introduces the latest development in infrared detector technology with the P13243 detector. These InAsSb (Indium Arsenide Antimonite) sensors are an ecofriendly alternative to Lead Salt detectors while still maintaining a competitive sensitivity. This new detector offers high sensitivity over 2.5µm to 5.3µm range with detectivity peaking at 1x109 (cmHz/W). Since these detectors are uncooled, they have low power consumption and a similarly low price; making it competitive with pyrometer technology. Since these detectors are photovoltaic, they also require much simpler electronics. These characteristics make the P13243 an extremely versatile detector for the detection and measurement of CO² and various hydrocarbons in applications such as gas sensing and environmental monitoring.